This 221-year-old Sheriff’s Writ is from Bristol County, Massachusetts. The document was issued a year after the Fourth Amendment (which prohibited unreasonable searches and seizures) was approved, along with the other nine amendments in the Bill of Rights. 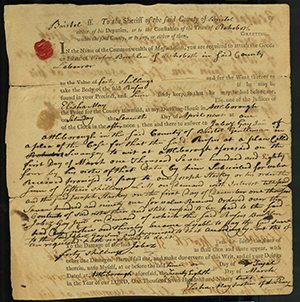 This writ detailed a case of an unpaid debt between Jabez Gay, Jr. and Rufus Bucklen, both from Rehoboth. It required Mr. Bucklen to appear in the court of Elisha May, Justice of the Peace, in Attleborough on “the Seventh Day of April next at one of the Clock in the afternoon,” 1792. The case, which dated back to 1784, was to be settled with damages for 40 shillings. The writ directed the Bristol County Sheriff or his deputies to ensure that the defendant arrive safely to face charges. This is a small but significant part of the Museum’s collection of 18th century artifacts that document the role of law enforcement in the young Republic.